2010 is likely to be the year of e-readers, if events at the Consumer Electronics Show, CES in Las Vegas is anything to go by. e-readers were everywhere at the CES, as vendors make frantic effort to get a share of the electronic reader market. From established manufacturers like Amazon and Sony to newcomers like Plastic Logic and Hearst, all were busy pitching their e-readers as the best for reading your e-books. Here we will look at e-readers that cut the most attention at CES, 2010. By the way, an e-reader is a portable device designed to display e-books. It may be designed specifically to display e-books, or come as a software in other devices like smartphones, laptops, netbooks, etc. No matter what form or shape an e-reader comes in, its main purpose is making reading your e-books pleasurable. Dedicated e-readers usually come with electronic ink display, which are readable in bright sunlight. Dedicated e-readers also offer long battery, with good e-readers offering more than a week reading on full charge. Amazon in an effort to respond to competition has added global wireless to the 9.7-inch model of its popular Kindle e-reader. With more and more e-readers offering larger displays, global wireless on Kindle DX is a smart move. Kindle DX e-readers with global wireless will start shipping to over 100 countries from January 19, 2010 for $489. Spring Design announced the Alex dual screen e-reader, which comes with a 6.0-inch electronic paper display and a 3.5-inch full colour touchscreen display. Alex e-reader runs the Android OS, making a mobile smart device as well. Alex is a truly global mobile wireless e-reader, supporting Wi-Fi, GSM, 3G, and EVDO/CDMA connectivity. Alex e-reader allows users access to internet via the 3.5-inch colour touchscreen. Coming Android OS means a number of useful apps may be available to make your Alex e-reader even more useful in the future. Alex e-readers will be available from February 22, 2010 for $359. Alex e-readers will access books from the Google books library as well as authorized book stores like the Kobo-powered e-book store from Borders with over 2 million titles. Plastic Logic announced an ultra-slim, flexible and shatter proof e-reader, the Que proReader. The Que proReader will be available in two models a 4GB model offering Wi-Fi and an 8GB model with AT&T 3G and Wi-Fi. Both e-readers come with 10.7-inch e-ink multi-touch sensitive display. The innovation in Pro Logic e-readers is the Plastic Logic technology, which makes it possible for circuits to be printed on plastic. Plastic Logic e-readers will go for $649 and $799 respectively and will be available in April, 2010, although you can pre-order now. Hearst Announced the Skiff e-reader, an ultra-slim e-reader that is only 0.25-inch thick. Skiff offers an 11.5-inch touch sensitive e-ink display. Skiff e-reader offers 3G on Sprint US and will come with 4GB storage. The Skiff e-reader can go for about a week on full charge. No definite date nor price information is currently available for the Skiff e-book reader from Hearst. Intel also showcased a very useful e-reader, all be it at a very steep price. The Intel e-reader can scan printed text and reads it aloud for the user, a feature that will be great for the blind and the partially sighted. Intel e-reader goes for $1,500. Physical e-readers were not the only electronic reading tools that were showcased at CES 2010, software e-readers were also on display. The Blio e-reader is a free software that converts almost any laptop, netbook, notebook, or smartphone into an e-reader. e-readers are portable devices designed to display e-books. They may be designed specifically to display e-books, or come as a software in other devices like smartphones, laptops, netbooks, etc. No matter what form or shape an e-reader comes in, its main purpose is making reading your e-books pleasurable. Dedicated e-readers usually come with electronic ink display, which are readable in bright sunlight. 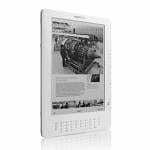 Dedicated e-readers also offer long battery, with good e-readers offering more than a week reading on full charge.